“That river is getting big enough, it has fish!” My driving instructor pointed at a wide, dark swath of water crossing one of the low spots at Circuit de Spa-Francorchamps that was fast approaching. “Sharks, not fish. If you don’t slow down they’ll bite you!” The Belgian chuckled and I slacked on the throttle a degree, trying not to grit my teeth as we splashed through the water. There was a feeling of the front tires coming unstuck from the tarmac for an eye blink before the rears, then traction again, then more throttle and a walloping crack of exhaust, and thwacking windshield wipers far slower than the drum of my heart. Of course, it had to be raining. 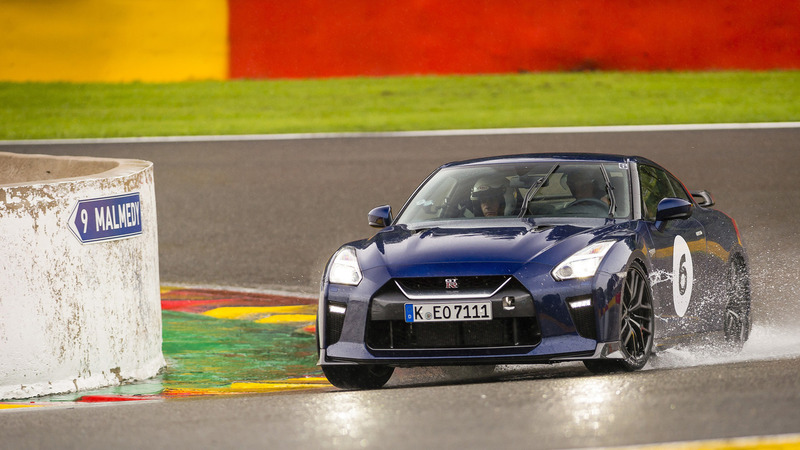 This isn’t what I pictured, a month before, when the email came through from the Nissan PR team to come out to Belgium – to one of the greatest racetracks in the world, and one that I’d never driven – for a test of the 2017 GT-R. I imagined charging up Eau Rouge, deftly deploying all 565 turbocharged horsepower as the car gripped hard and pulled me rightward up the hill. There may have been a sunset in my mind, framing the galloping Godzilla at that storied curve, but instead I saw a dense corona of fog around yellow flag lights, several times over the course of a stirring afternoon. The GT-R has mellowed way out. 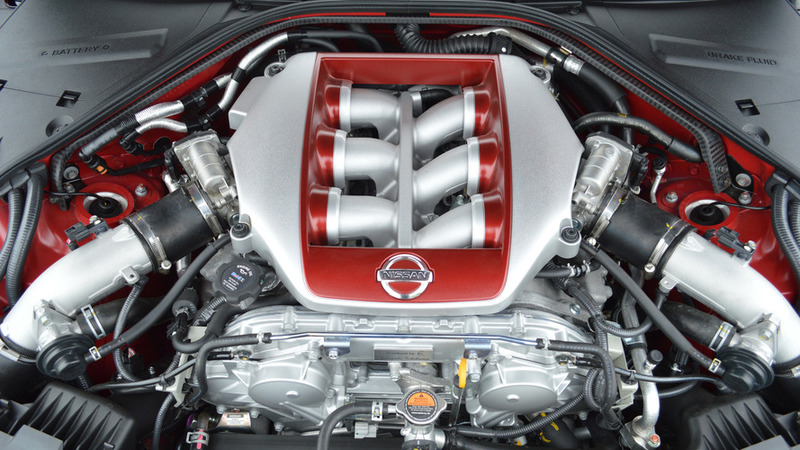 The good news was that I’d already learned the biggest part of what separates this GT-R from the now outgoing car – a vehicle gradually evolved each year since it launch for the 2008 model year. Learned it not on the sodden race track, where Nissan’s supercar is, more or less, the same stirring proposition that it’s always been, but on the autobahn and B roads that composed my route from Düsseldorf to Spa. And the lesson was this: the GT-R has mellowed way out. The basic specifications don’t do much to tell the tale of what’s new. Heading the numbers are an increase of 20 horsepower and 4 pound-feet of torque (for a total of 467 lb-ft). Added to that is the cool inclusion of a weight-saving titanium exhaust system (trim for trim, curb weight has increased just 11 pounds for the ‘17 car). 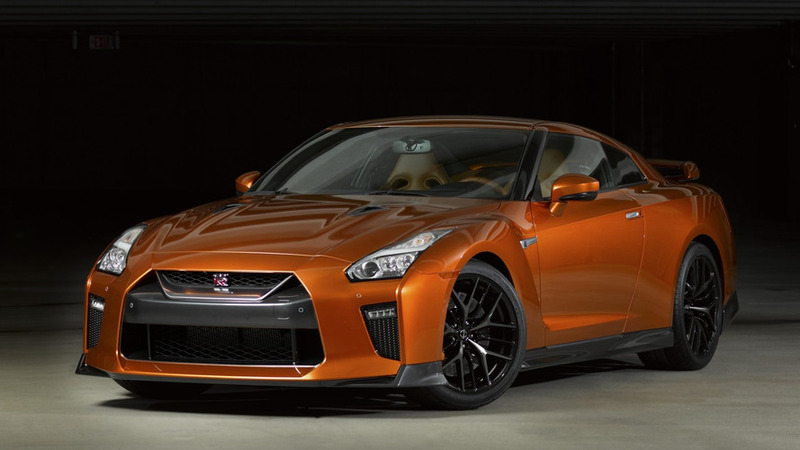 Taken together, you might expect the never-shy GT-R to be meaner than ever. That’s not the case. Starting the road drive from a parking deck next to the airport, I fully expected the Nissan to shake loose a few car alarms when I first woke it with the dab of a starter button. But the ripping note of the car I’d driven many times over the last eight years wasn’t there; in its place was an aggressive, low, almost melodious growl that merely intimated Earth-turning power, rather than shouting it. The tremor through the steering wheel, something I’d expected from earlier GT-Rs, was gone. Inside the car the storyline is the same, but with a more dramatic departure from old to new. When poking around in traffic, or at a steady fast cruise on the motorway, the levels of noise, vibration, and harshness were unpredictably low. Sure, when I choose to drop a few gears, slam the accelerator and torch the rear tires, a familiar, howling V6 screech was mine as a reward. But in the slog of normal traffic, something I encountered more than a few minutes of on my 130-mile trip to the track, the most cabin-intrusive sound was the hum from those fat tires under me. Even the grumble from the gearbox has been muted. Nissan is still using a six-speed dual-clutch transmission to handle all of the GT-R’s ample power, but the unit has been refined. Gone is the rifle-shot crack from each gearshift, replaced by a still-solid-feeling, but much sweeter “chunk” from one ratio to the next. Both on track and on the street, the response time from the trans still feels quick, but the tremor through the steering wheel, something I’d expected from earlier GT-Rs, was gone. Following the narrative of a far more mature car, the ride profile has been smoothed over as well. There’s still plenty of road feeling that comes through via the chassis and the steering wheel, but not so much that bumps and cracks threaten to unhinge your jaw. 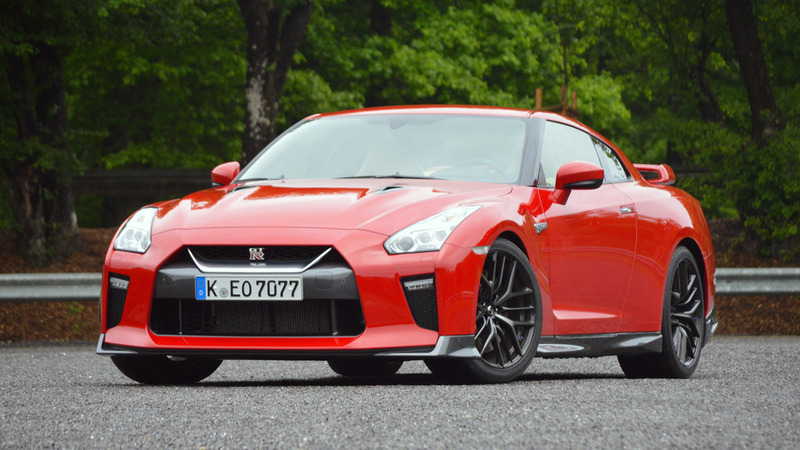 For me, it’ll take driving the GT-R on my own hometown roads in Michigan to see if the suspension has been sorted for truly bad surfaces – the German and Belgian roads I drove were predictably smooth – but there’s no question this is a more amicable car than it has ever been before. The behavioral change is far greater than the visual one, both inside and out. The behavioral change is far greater than the visual one, both inside and out. Sure, if you’re a car nerd like me it’ll be easy for you to spot the new GT-R grille, with a swooping metal accent that follows Nissan’s new family look. But most casual observers – who all, by the way, are likely to think any GT-R looks like a Klingon surface rover – won’t pick out the subtlety. The car hasn’t stopped being brutally edgy, unreasonably long, and essentially Japanese. The car I drove wears the European “Prestige” grade, or approximately the same as we’ll get as the “Premium” trim in the U.S. There’s much that is new in the cabin, including a massive button reduction and a new eight-inch touchscreen display. I’ll be honest in saying that I was far more absorbed in evaluating the driving experience to really fiddle with the software, with the exception of the navi system that guided my route. For that I’ll say that there were straightforward graphics and a simple interface, but the navigation instructions were sometimes too slow to keep pace with the car – forcing the unenviable choice between slowing down or missing my turn. This mad machine has a seemingly endless array of configurable digital clusters; why can’t I get a head-up displays? There’s much that is new in the cabin, including a massive button reduction and a new eight-inch touchscreen display. All of it – the fancier interior, the quiet, the placid suspension – defy my expectation of what a GT-R should be. That is: A barely tamed race car that manages to be unnaturally quick, unnaturally grippy, and unnaturally heavy all at the same time. From the standard car to the Nismo, every previous iteration of the R35 I’ve been lucky enough to pilot has offered a razor-sharp experience, just clinging to the bleeding edge of presentable as a modern road car. For 2017 that personality isn’t gone, but it is mostly hidden. During the later laps at the track, after my fear of the wet had somewhat receded and a spark of understanding of Spa’s layout had ignited, I could see that Godzilla was still lurking just under the surface. Asked for a change of direction with just the proper amount of steering input, and the GT-R would obligingly nose-in neatly, even on quick switchbacks where the car’s amazing length should make it feel ponderous. Now, if I asked for that same change with too much attitude, the rear of the car would swing out quickly enough to remind me that this is no “video game car.” It’s a demanding machine that requires balance and patience to fully exploit its truly supercar-like performance envelope. 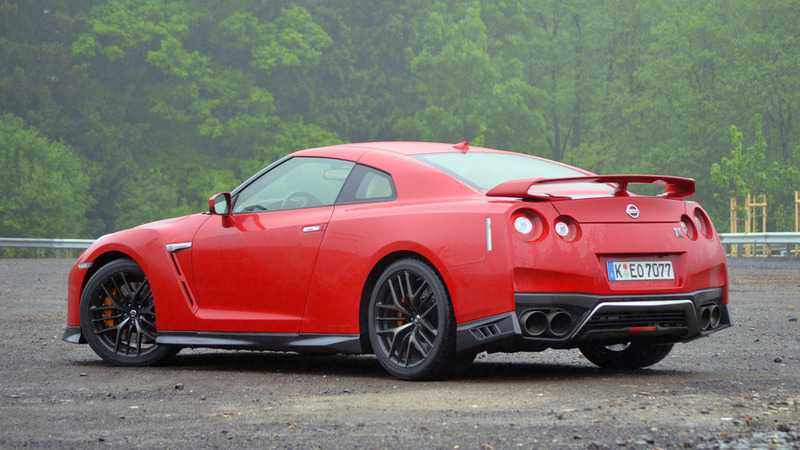 You have to drive the GT-R fast – really fast – to hear it, but this car loves to talk to its driver. In the end, the rain helped me see that more than it hindered. For one thing, with my adrenaline spiking and senses very alert, it was simple to see how well the GT-R communicates levels of grip to its pilot – certainly a factor when there’s little grip to be found. Rough curbing felt rougher, slick pavement more slippery, and the various ‘rivers’ around the drenched circuit… let’s just say I felt the sharks’ teeth more than once. 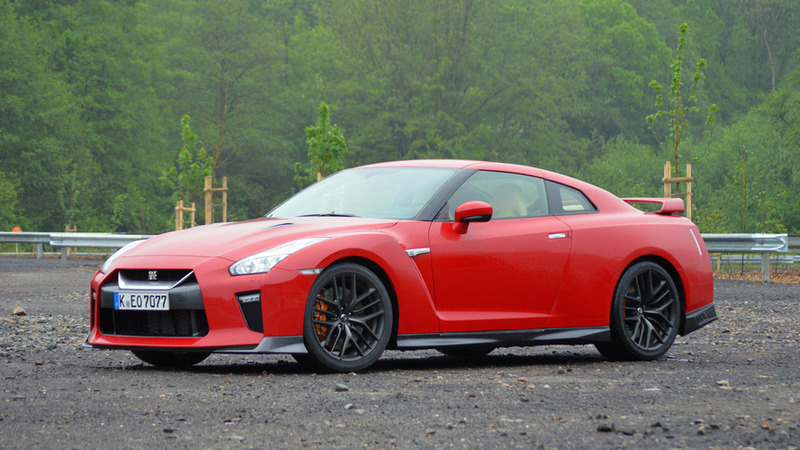 You have to drive the GT-R fast – really fast – to hear it, but this car loves to talk to its driver. Even now, with more of a suit-and-tie persona, Nissan’s top sports car is a living thing. When the car goes on sale in the U.S. in July, you’ll have to pay more dearly than ever for that dichotomy. The GT-R now starts at $109,990 (plus $1,595 for destination and handling), which is about $8,000 more than the outgoing car. My tester had at least $4,295 worth of options ($4K for the premium interior package, $295 for carpeted floor mats) bringing the estimated as-tested number up to nearly $116,000. There’s not another car on the planet just like this. Objectively, $116,000 is a lot of money to pay for a car, even a sports car. Comparatively it’s kind of a bargain if you look at the competitive set in terms of similar performance: The Audi R8 and Porsche 911 Turbo both start at more than $160,000. Of course, the curve-wrecking Chevrolet Corvette Z06 is more powerful and tens of thousands of dollars cheaper, albeit without all-wheel drive. 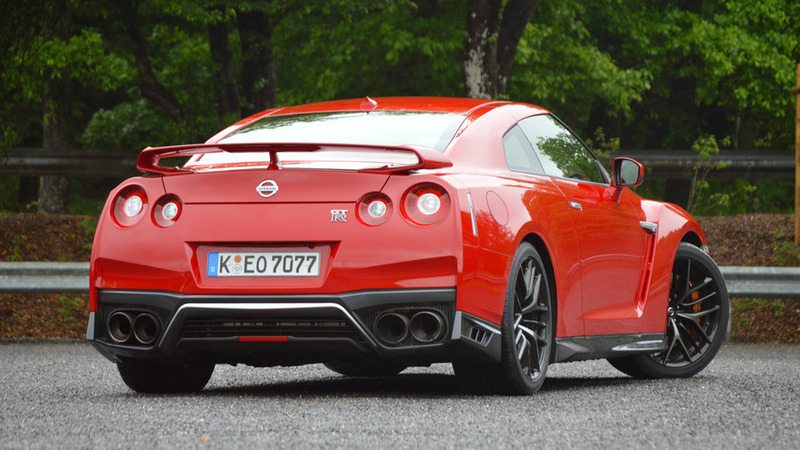 Nissan doesn’t care much about those comparisons – or claims not to – as it has data that shoppers in the market for a GT-R typically don’t want much else. 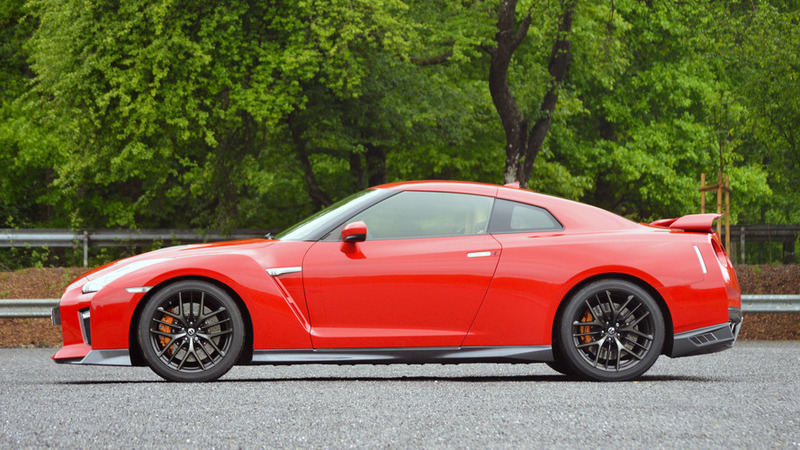 The company has data that says 63 percent of GT-R buyers didn’t cross-shop anything else. I can believe it. There’s not another car on the planet just like this. Refined or no, raining or not, and on a world-famous racing track or just taking the long way to the office one morning, the 2017 GT-R is just as scary, satisfying, and surreal as it ever was as long as you’re willing to push it there. Just be careful of the biting fish.